Luxury wellness seekers return time and again to The Spa at Esperanza, part of Esperanza, An Auberge Resort in Cabo San Lucas, Mexico. It’s easy to see why: Step through the massive wooden garden gates and enter a lush tropical paradise complete with the signature water passage experience, which includes a warm-spring soaking pool, steam caves and a cool waterfall rinse. Use the water passage to stimulate your lymphatic system and loosen stiff muscles in preparation for your treatment. The 14-room spa is known the world over for its pampering treatments using local and organic products (it's the only hotel spa to carry the Marie Veronique Organic line) that draw from plants and ingredients native to its Baja Peninsula home. 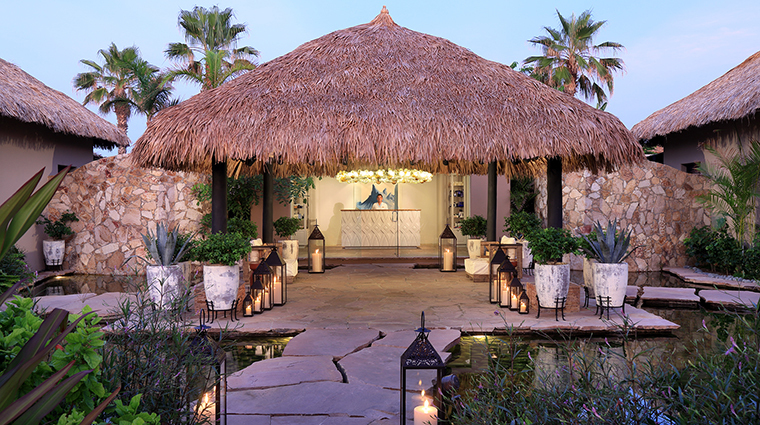 Much like the resort itself, guests of the spa are met by architecture that complements the natural beauty of the surroundings, including a palapa-style roof and original Mexican artwork throughout the space. A robust array of treatments form a well-rounded menu, ranging from Baja Lime Brightening and Lightening facials and beachside massages to Sol Relief, an avocado-based treatment geared towards revitalizing sun-damaged or burnt skin. Complimentary fitness classes lend a holistic feel to the wellness offerings. Each week, the spa provides more than 60 such classes, including sunset and sunrise yoga, Zumba, TRX and salsa dancing. You are encouraged to linger after treatments on the spa patio with agua frescas, made-to-order juices in flavors such as watermelon ginger and cucumber chili pepper. Although the spa itself is several hundred yards from the main resort and the water, its design draws most of its inspiration from Esperanza’s coastal environment with warm colors, traditional textures and original Mexican artwork. A focal point of the spa is the wooden entranceway, where massive wood garden gates usher you in to the spa area proper, a lush garden oasis accented by numerous water features. If you really want to work up a sweat, plan to attend one of the spa's Fitness Retreats, where it brings in expert instructors from all over North America to conduct a series of complimentary classes (both group and private). 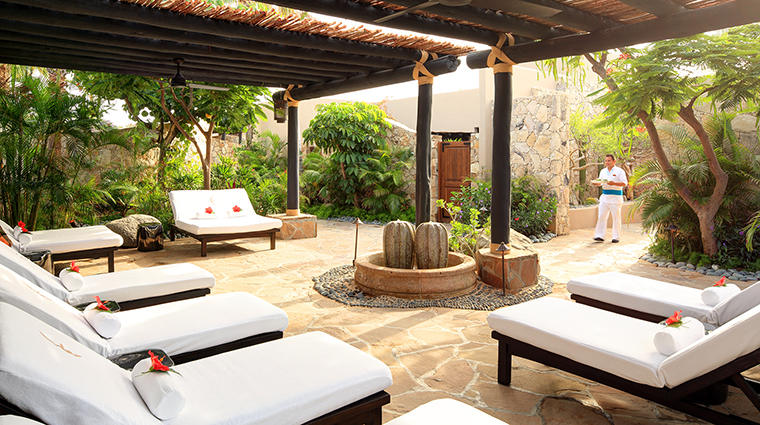 The Spa at Esperanza uses a variety of skincare products but focuses on organic lines. The spa’s signature line is Marie Veronique Organics, designed by esthetician Marie Veronique Nadeau. In many other services, the spa uses fresh products like aloe, cucumber, avocado, papaya, pineapple, mango and Baja lime. Massage therapies at The Spa at Esperanza range from traditional Swedish and deep tissue to a technique dubbed the Shared Hearts Massage — therapists work in tandem, switching guests halfway through the treatment — offered exclusively to couples. The spa offers three branded signature treatments, ranging from the Auberge Attunement, a blend of massage techniques, to the Auberge Head to Toe, a “firm and nurturing” massage complemented by a scalp treatment, foot reflexology and warm towels. Other treatments include Thai, a Cuatro Manos, Dos Corazones treatment (four-hands massage) and a Cabaña Lime Massage, where therapists use lime compresses during the treatment to rejuvenate sunburnt skin. Each of the 14 treatment rooms is designed as a private garden suite, featuring a patio with latilla-style shade covering and outdoor shower area. Several of the rooms feature private water facilities (such as soaking pools) and space to accommodate couple’s treatments. The signature water passage experience is not to be missed. The water features include a warm-spring soaking pool, steam caves and a cool waterfall rinse.